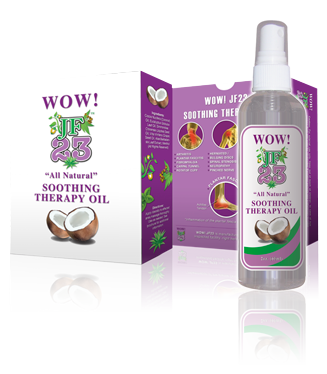 WOW JF23 Soothing Therapy Oil is a unique formulated blend of five unique essential oils. 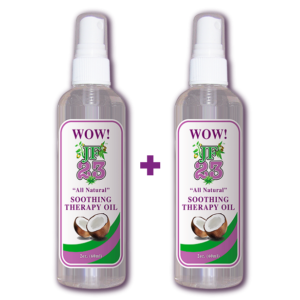 Each contributes to the amazing soothing temporary relief for arthritis, aches, pains, muscle soreness, stiffness, etc. 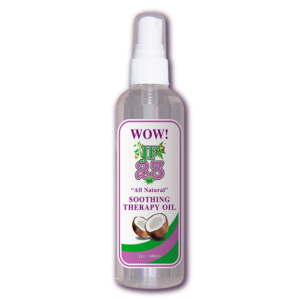 Coconut Oil – Using coconut oil for arthritis to lubricate muscles and joints works extremely well. It promotes circulation in joints. It reduces stiffness and increases joint flexibility. 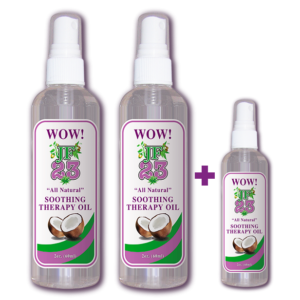 Coconut oil used as a carrier, blended along with the following 5 essential oils, can bring you the immediate temporary relief you seek. Menthol – One of nature’s most effective natural pain relievers. Rubbing with menthol instantly brings cool, soothing pain relief to aching muscles. Grapeseed Oil – This oil helps promote tissue elasticity. Grape seed oil serves as an anti-inflammatory to help reduce swelling. It can also help heal and improve circulation. Aloe Vera – This oil opens up the pores to help receive the other ingredients. It also helps to stimulate the blood circulation. Jojoba Oil – This oil is widely known for its deep penetration and quick absorption qualities. USP Eucalyptus Oil – This is a pharmaceutical grade of oil, which is the main ingredient. We use the purest form of eucalyptus available due to its double distillation process and is rated 88% cineole. Cineole is the active medicinal ingredient in eucalyptus. WOW! JF23 uses the purest available.